Come see us in Chicago at Renegade Craft Fair this weekend! On the road again! We’re so thrilled to be a part of one of our favorite shows of the year, the amazing Renegade Craft Fair in Chicago, IL. Join us and over 300 (yep! Amazing right?) of the most talented and cool makers of handmade awesome in the country & beyond. We will have lots of new prints and posters and more, so don’t miss out friend! Renegade Craft Fair is FREE to attend. 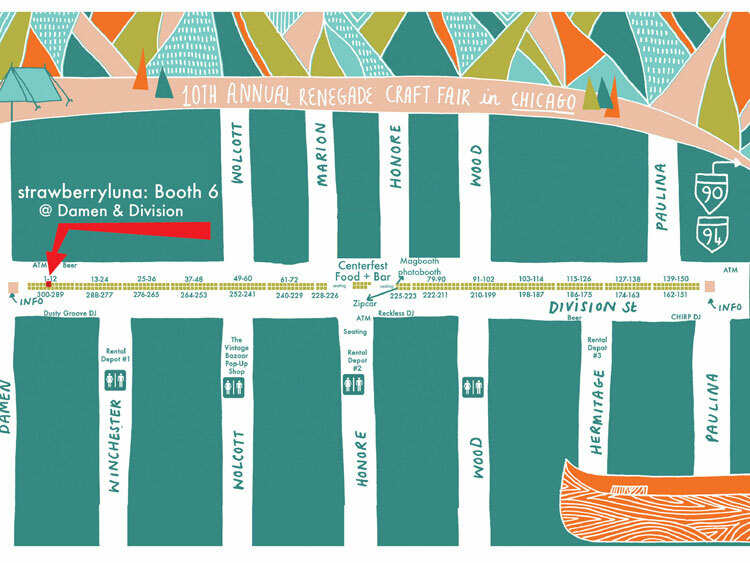 Where: Along Division Street from Damen to Paulina in Wicker Park for the biggest + best Renegade Craft Fair of them all! What: We’ll have hundreds of today’s greatest indie makers along with interactive workshops, tasty local food + booze, music + more. Get ready, Chicago, it’s going to be the best RCF yet! Why: Because handmade is best! Check out this year’s lineup of amazingly talented artists! Check out hands-on activities from Vogue Knitting (they’ll be leading make-and-take knitting workshops), the Chicago School of Shoemaking (you can stamp your own leather pieces and watch shoes being made by hand), Lillstreet Art Center (you can try your hand at using metal-stamping techniques to make your own pendant), the Student Art Therapy Association of SAIC (they’ll be leading worry doll-making workshops, a community weaving project, and a t-shirt necklace project), Girls Rock! Chicago (make a rad rock-and-roll button), the Urban Prairie Waldorf School (students from the school will be teaching you how to make jump ropes from organic fabrics), andPébéo (you can paint your own ceramic tile with their new paint pens). The Vintage Bazaar will host a pop-up vintage market at Renegade. Make sure to visit their section of the fair at Division and Wolcott. Below is a handy map for you, with the strawberryluna Booth #6 Location. Want to see a larger version? Click here or on the image below. You’re welcome.